Murder mysteries are perfect entertainment options for large groups, corporate events, fundraisers, nonprofits, schools, and private parties in Maryland, such as Baltimore and Inner Harbor, Towson, Columbia, and Annapolis. We’ve performed in state capitals down to towns with zero stop signs! 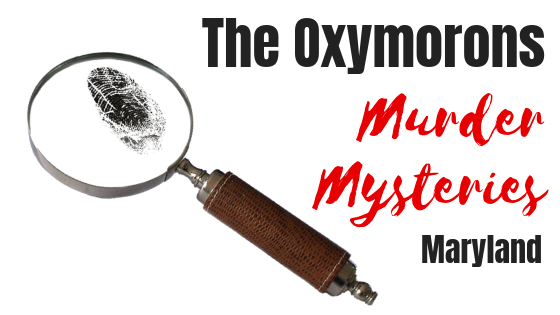 The Oxymorons Murder Mystery show is a fantastic evening your guests will love! We work with you to provide a customized experience, from picking a theme that works with your group to how involved you want the audience to be to finding a sweet spot in your budget. You’ll get to help solve the “whodunnit?” with costumes, hilarious characters, and lots of laughs in between. Our troupe is filled with veteran murder mystery performers who can make sure any crowd, from CEOs and VPs to a Friday night at the firehall, will have a great time. Contact us today to get a free quote or book the troupe! Our weekends do fill fast so please get in touch. Not what you’re looking for? Look at our other entertainment services! The Oxymorons have been featured in the Baltimore Improv Festival and were the in-house improv troupe of Magooby’s Comedy Club. We would love to do your murder mystery in any of the following cities and Maryland hotspots and adjacent towns: Baltimore, including Inner Harbor and throughout the Chesapeake Bay; Brooklyn Park; Catonsville; Clarksville; Columbia, Dundalk; Glen Burnie; Linthicum; Lochearn; Owings Mills; Parkville; Pikesville; Rosedale; Towson; or Woodlawn, or the general D.C. suburbs. What's the potential event date?